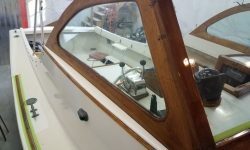 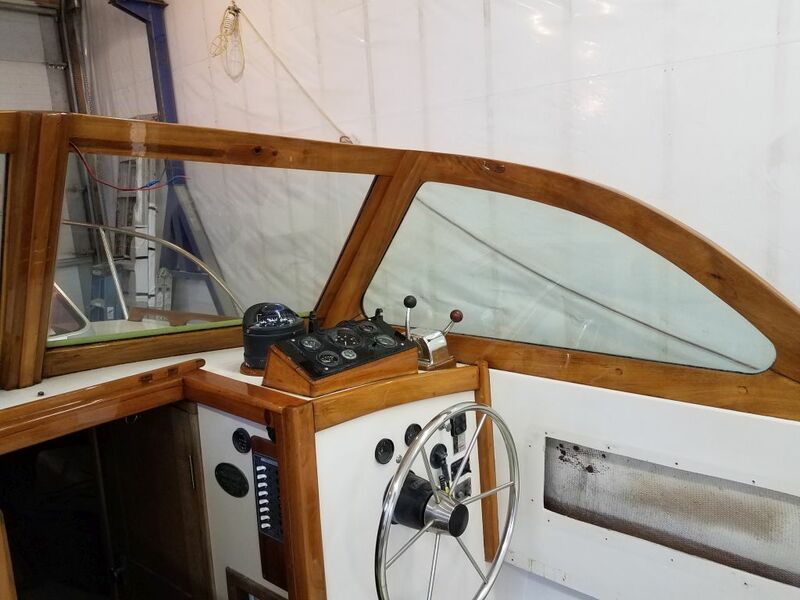 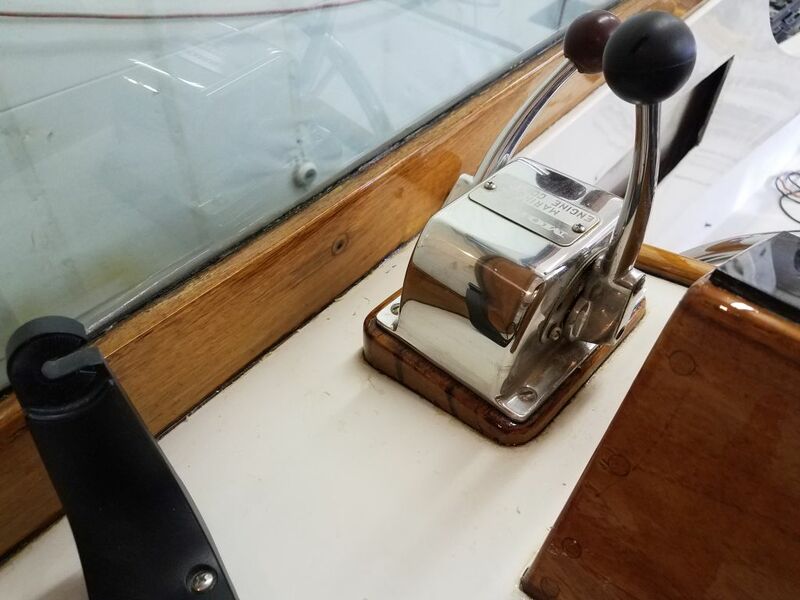 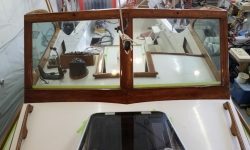 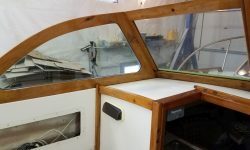 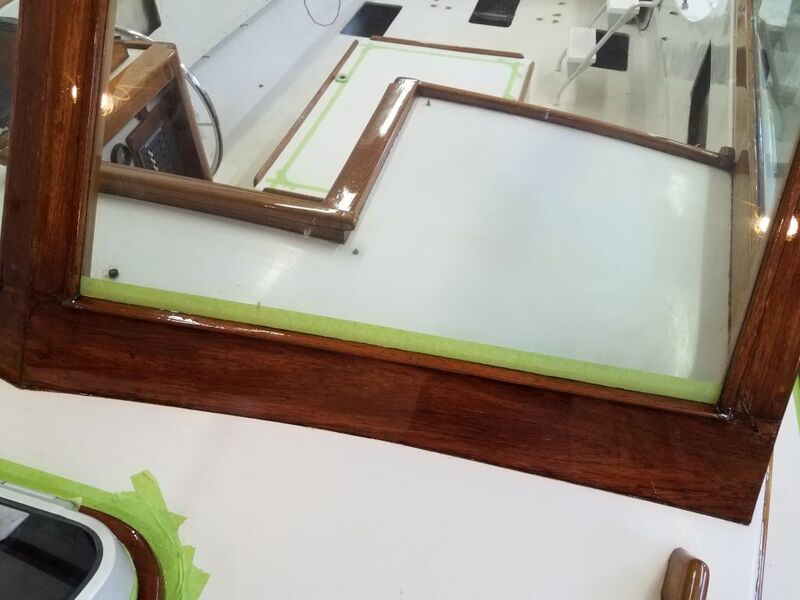 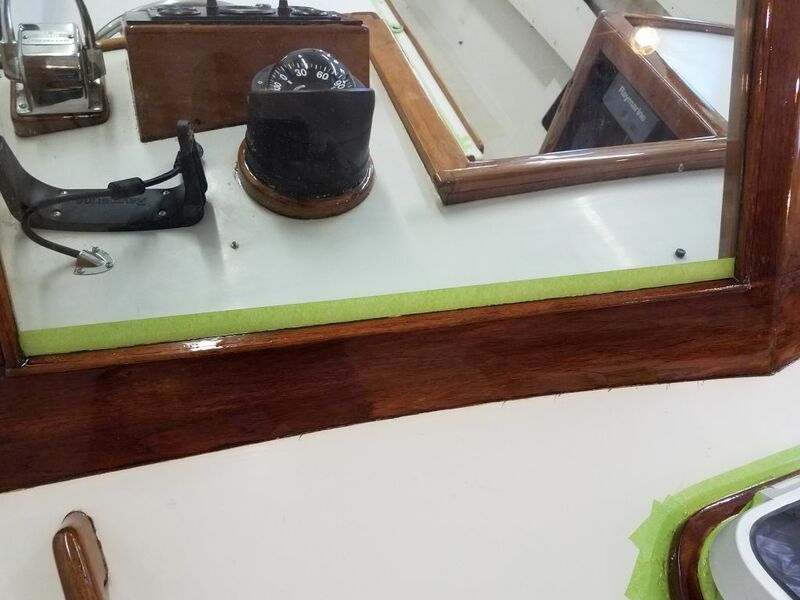 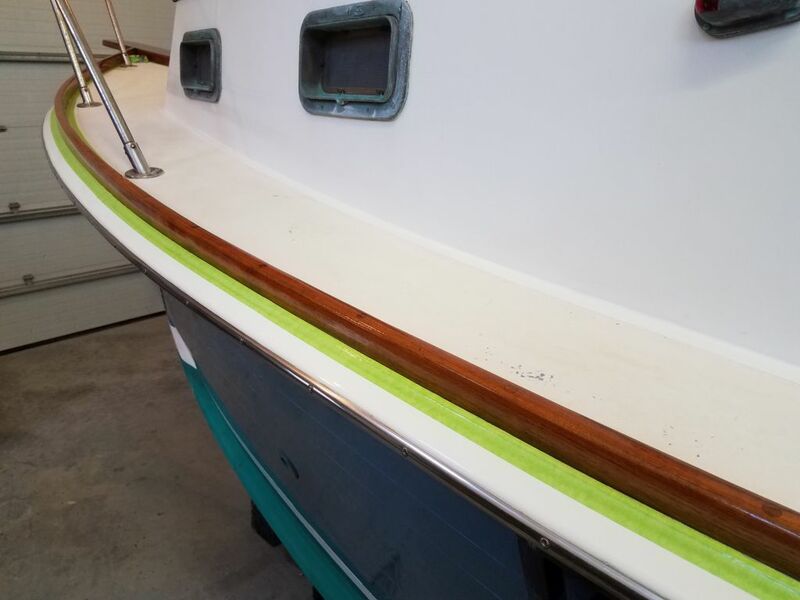 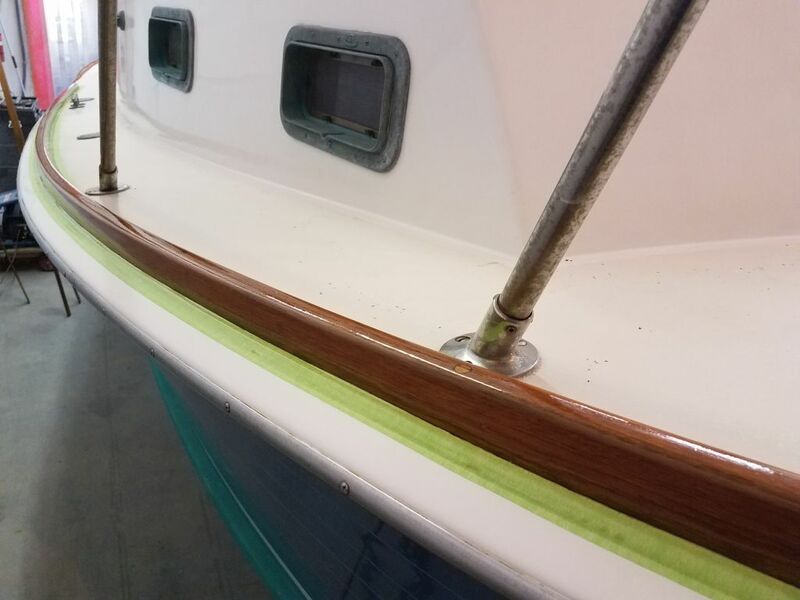 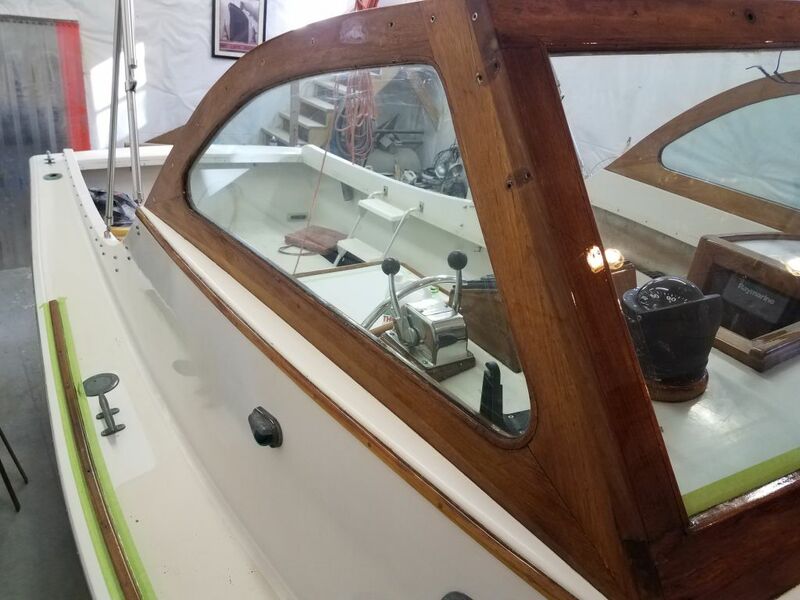 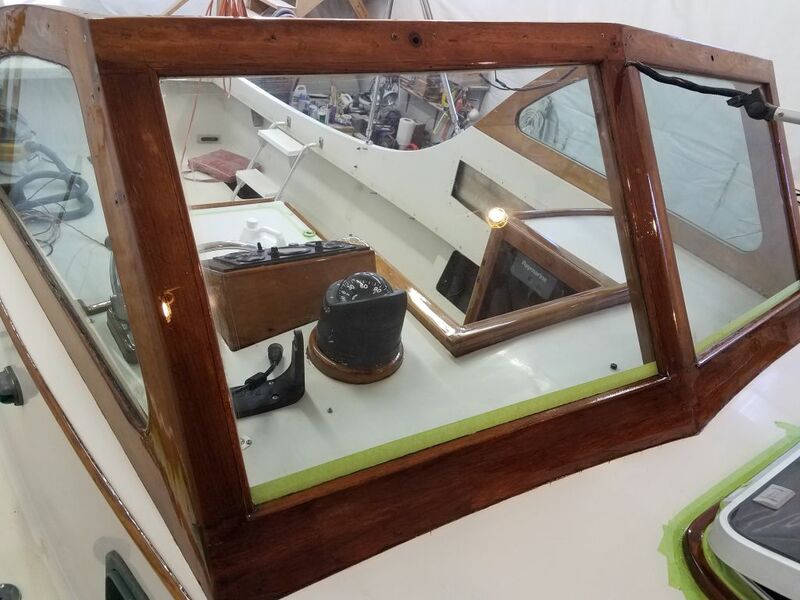 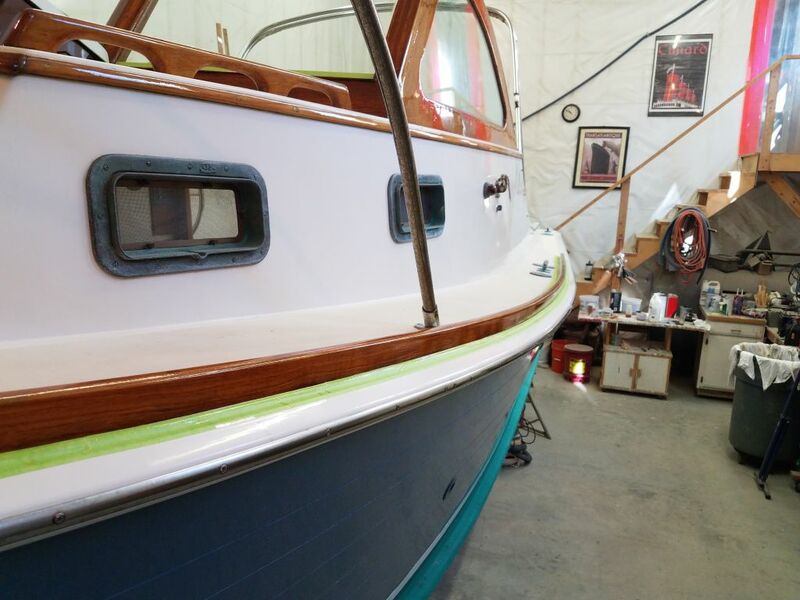 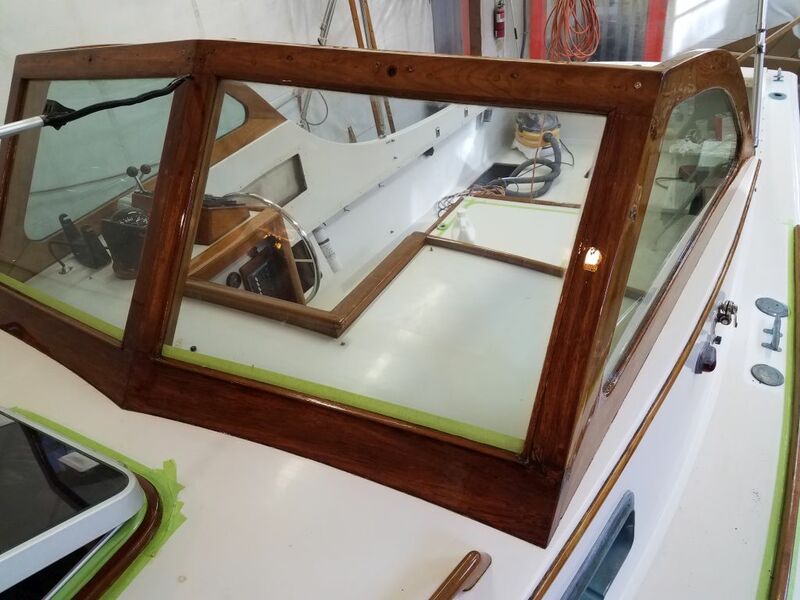 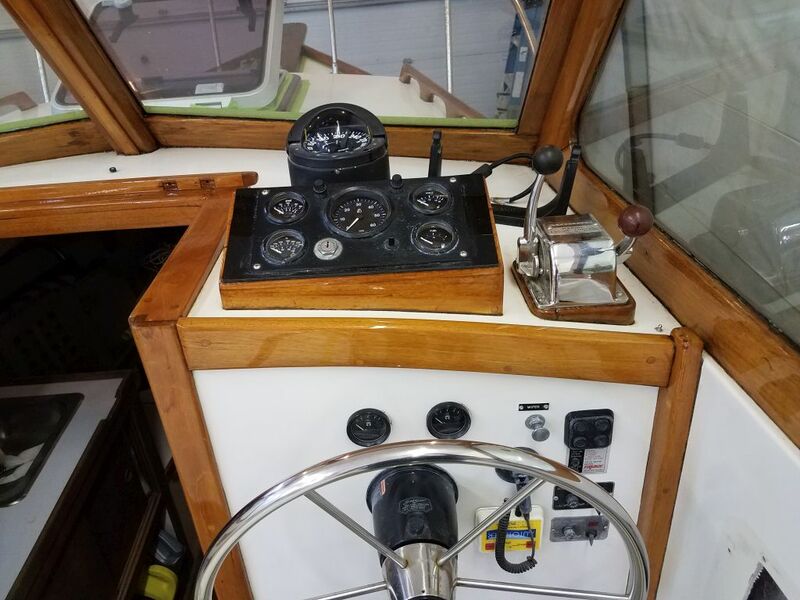 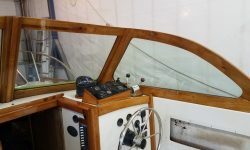 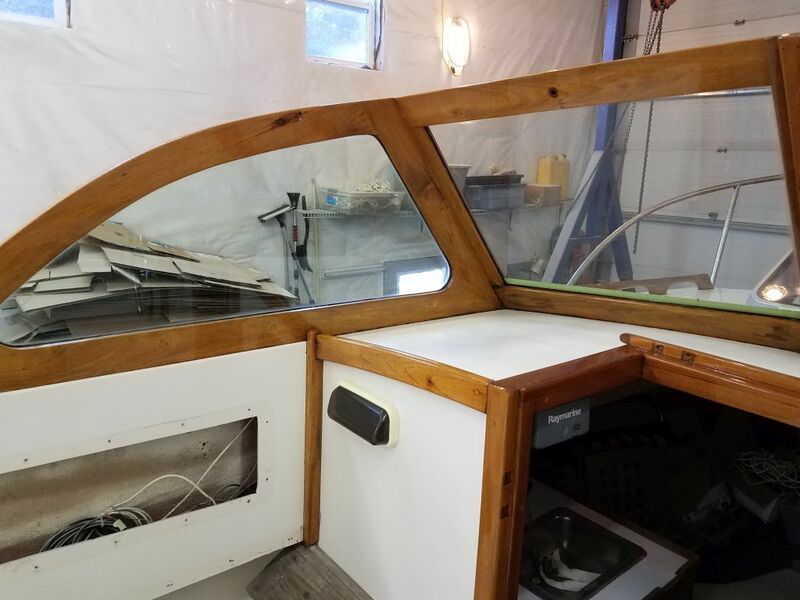 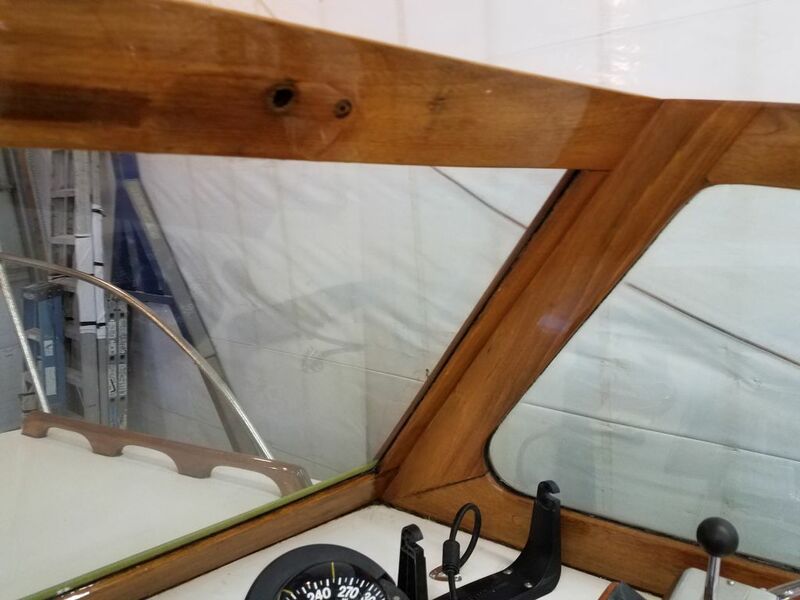 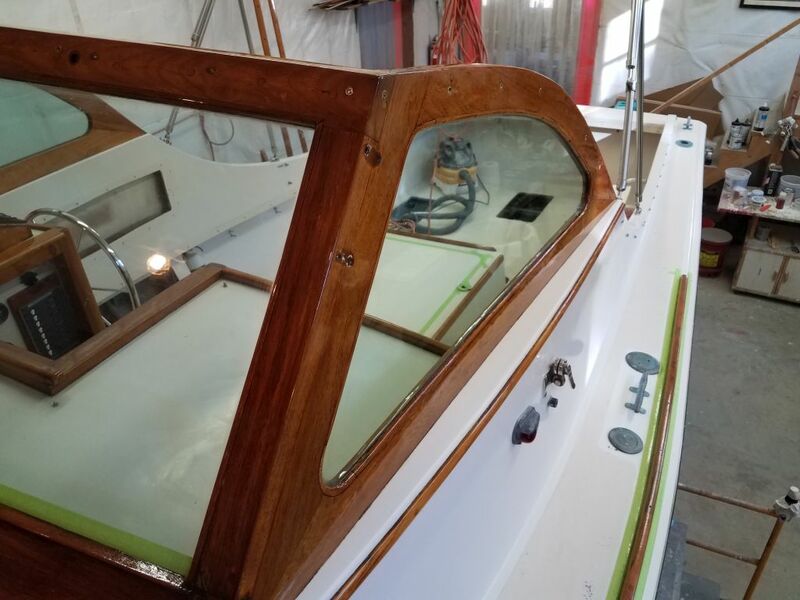 With two good maintenance coats of varnish on the dash area and windshield, along with the handrails and eyebrow trim, I deemed these areas complete and removed the masking tape. 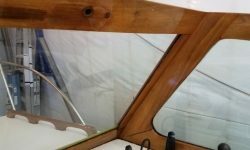 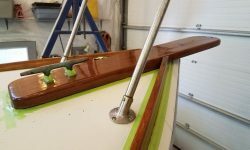 Meanwhile, I took care of a few small jobs, including reaming out and filling a series of small holes in the aft part cockpit sole, where I’d removed some screws apparently leftover from a set of cooler mounts. 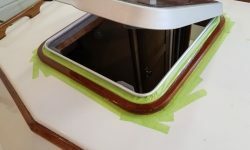 Once the epoxy cured, I’d sand it as needed before applying the nonskid coating later. 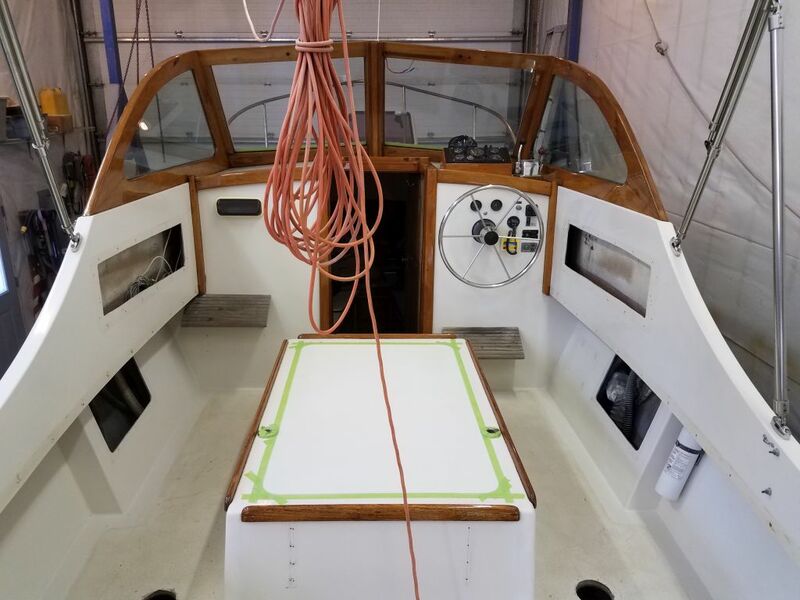 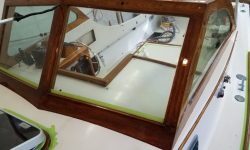 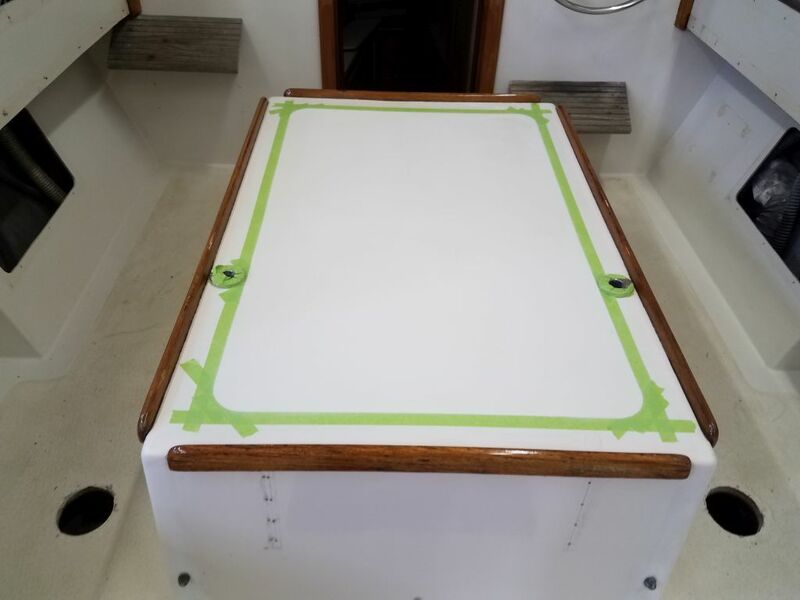 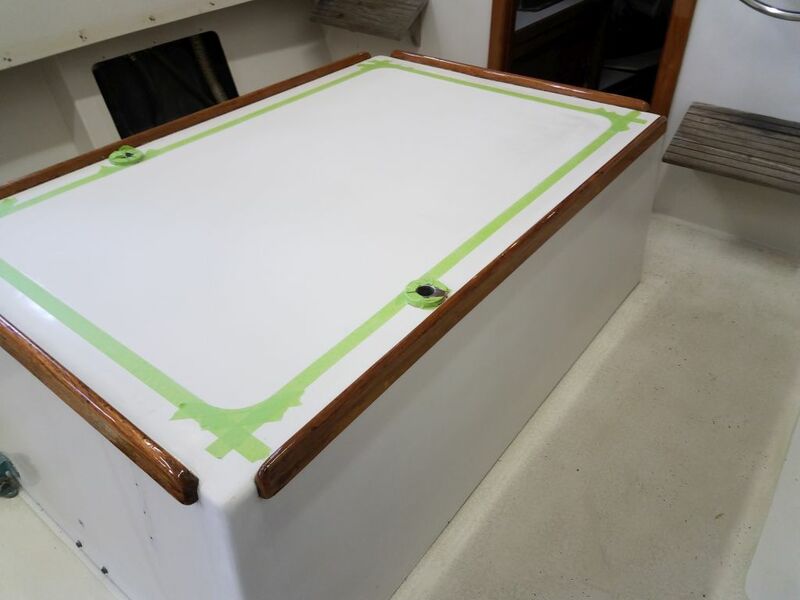 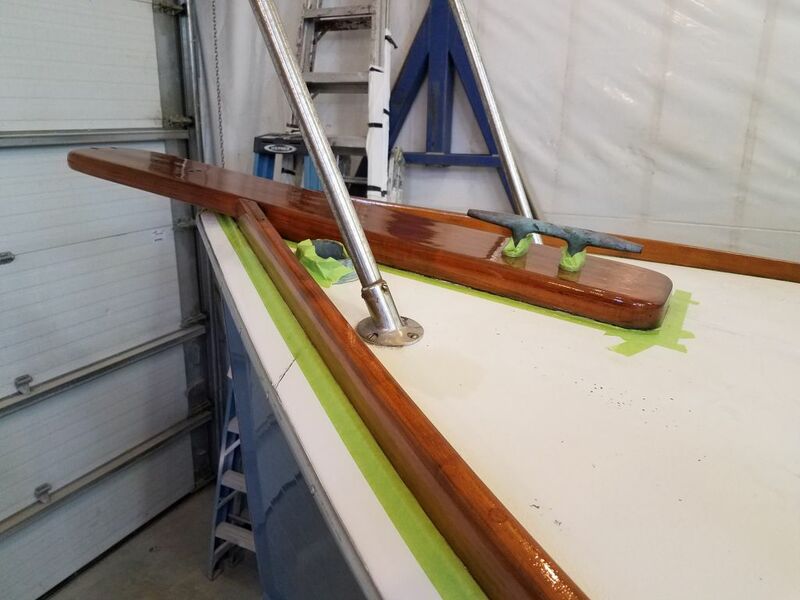 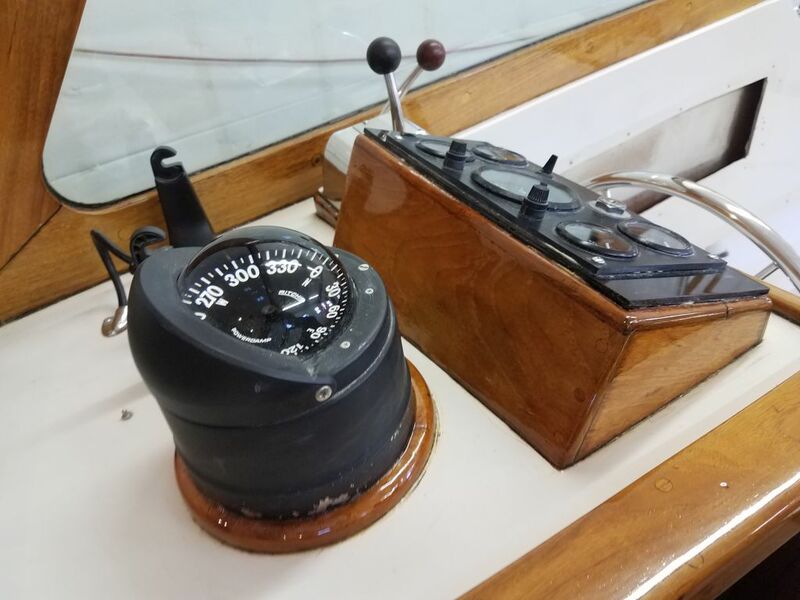 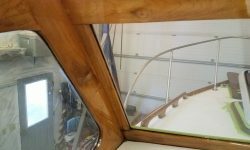 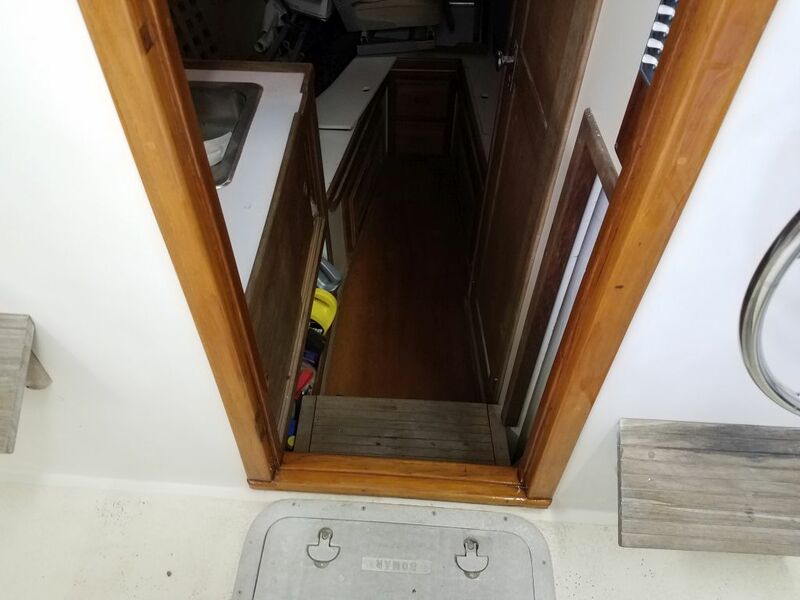 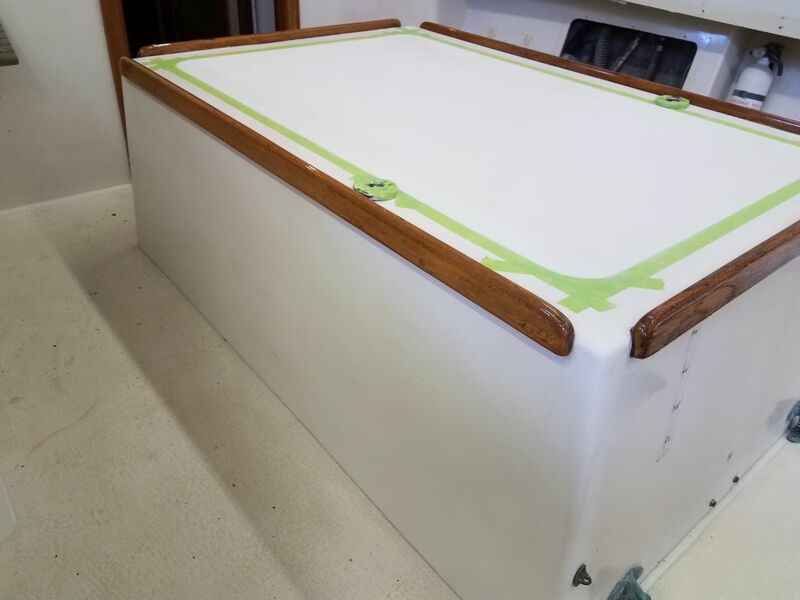 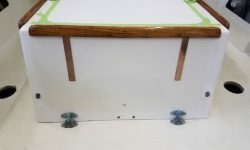 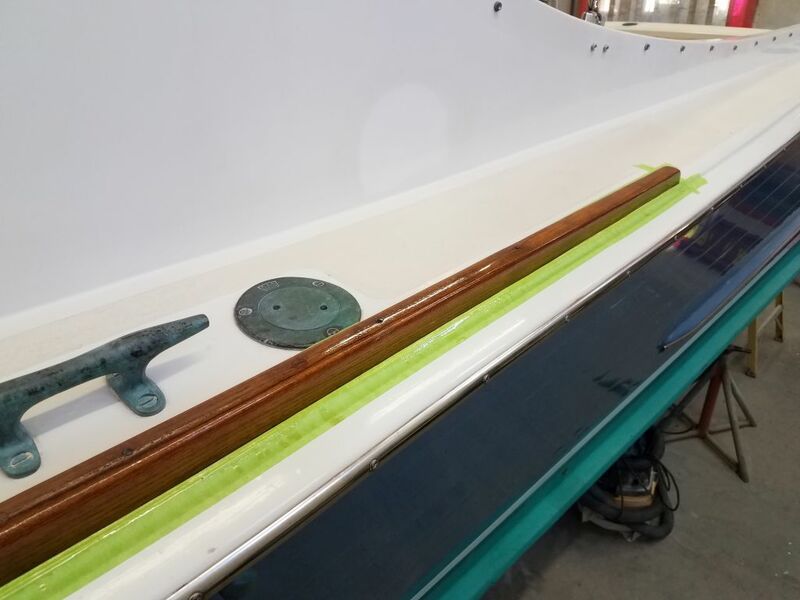 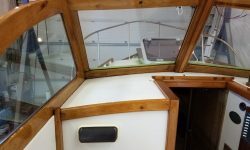 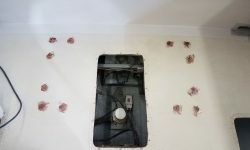 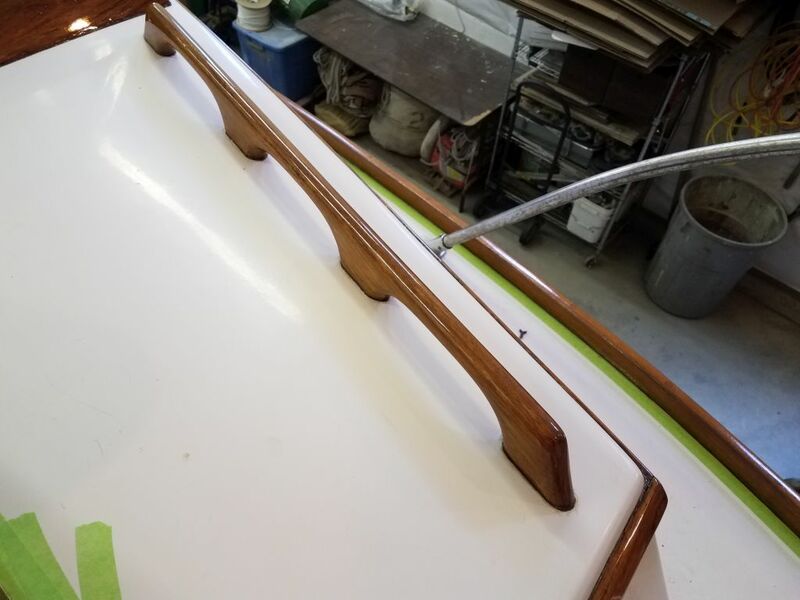 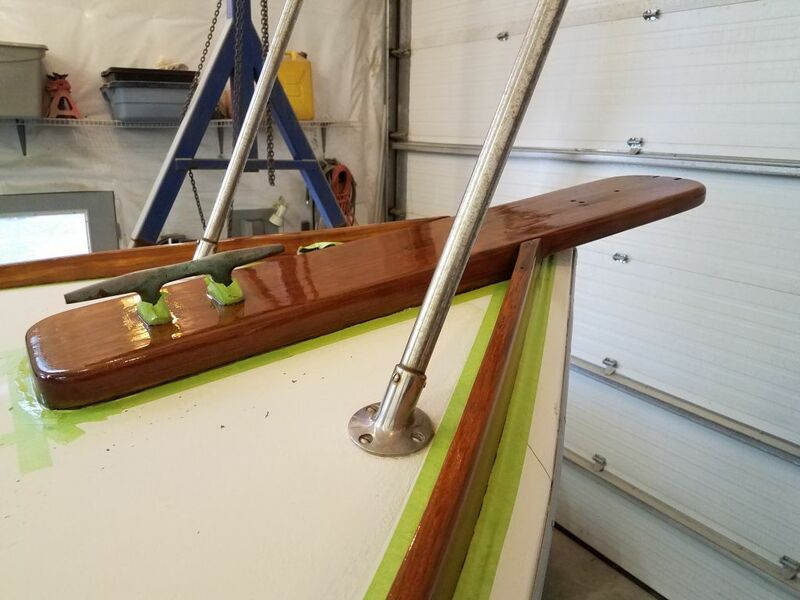 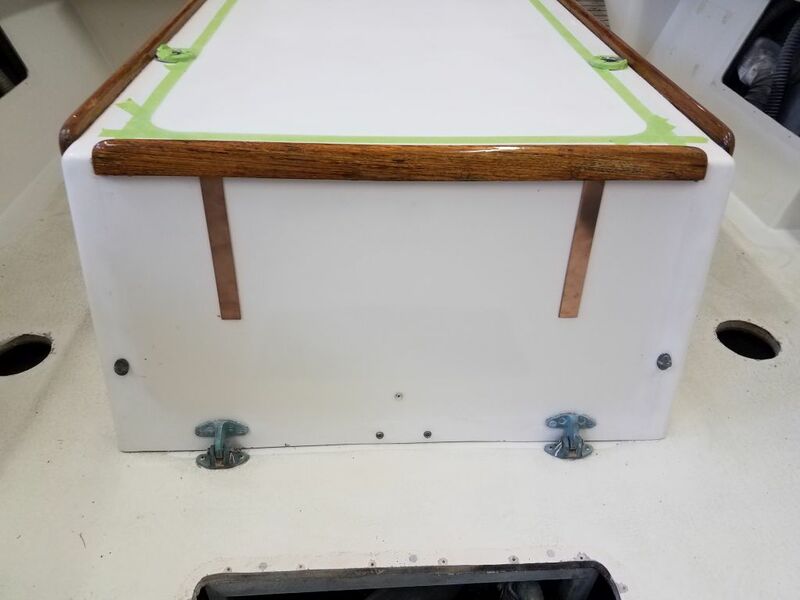 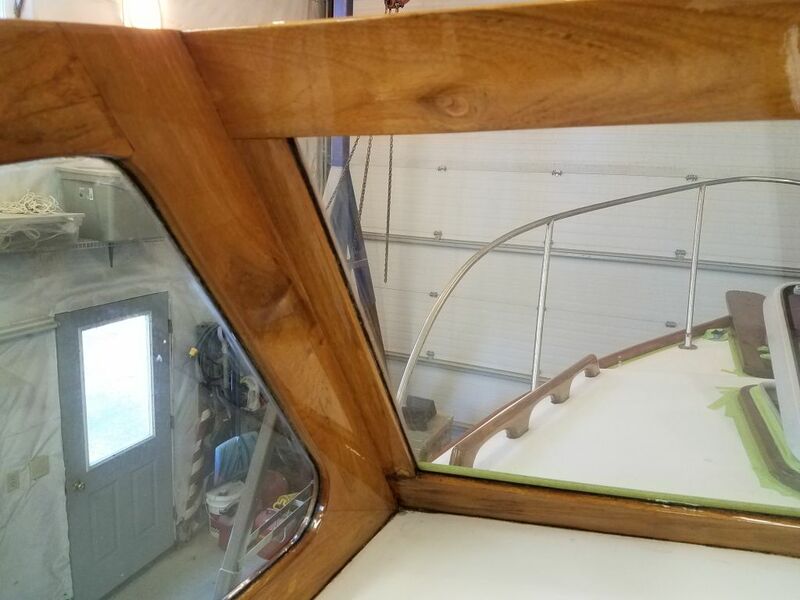 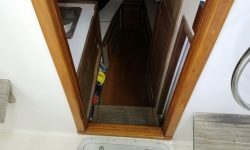 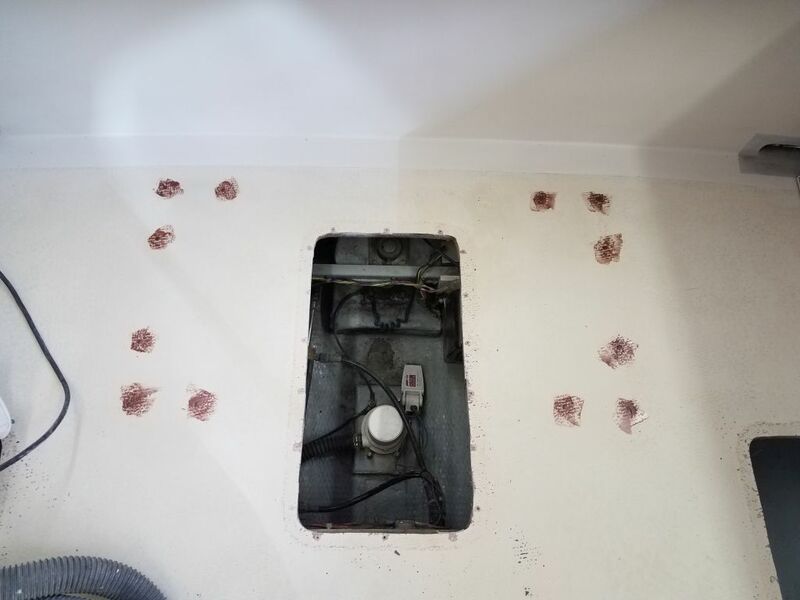 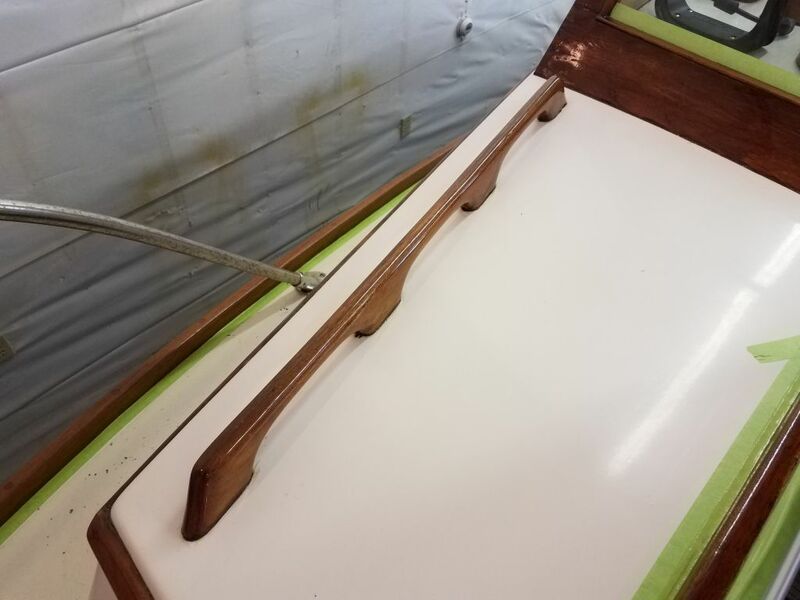 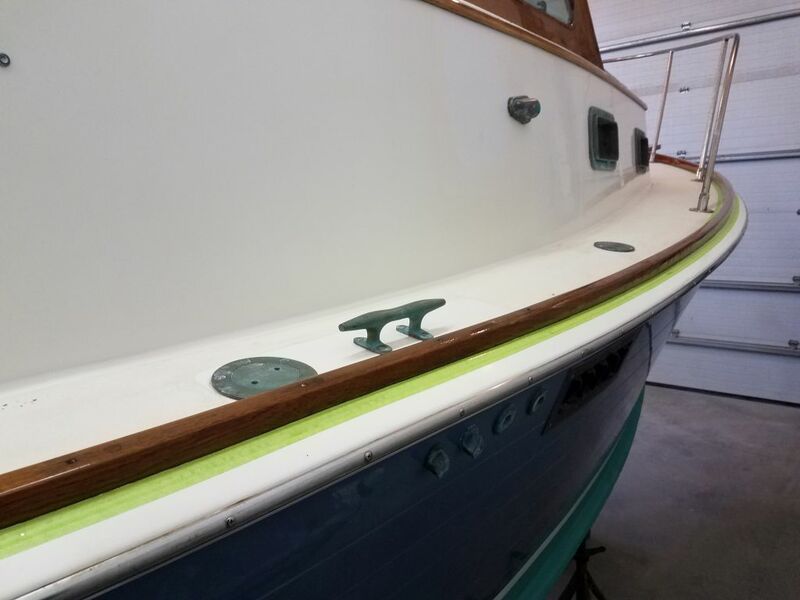 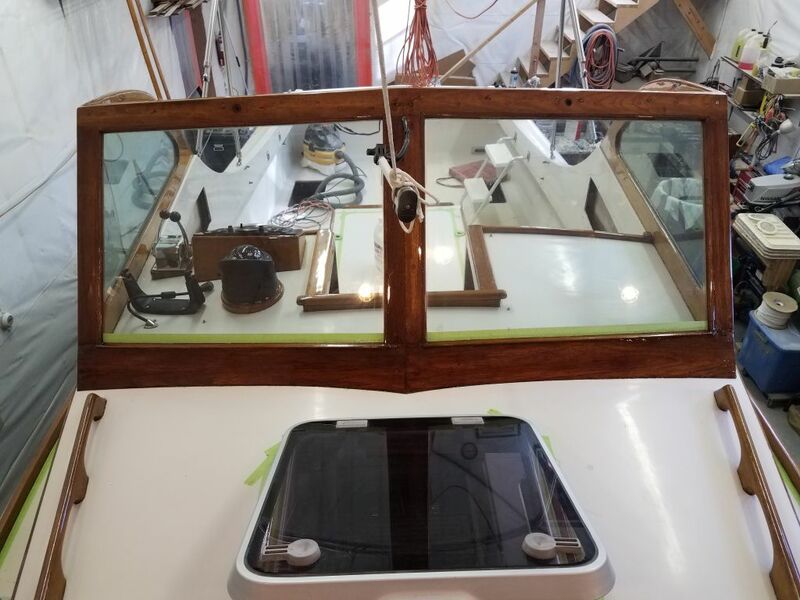 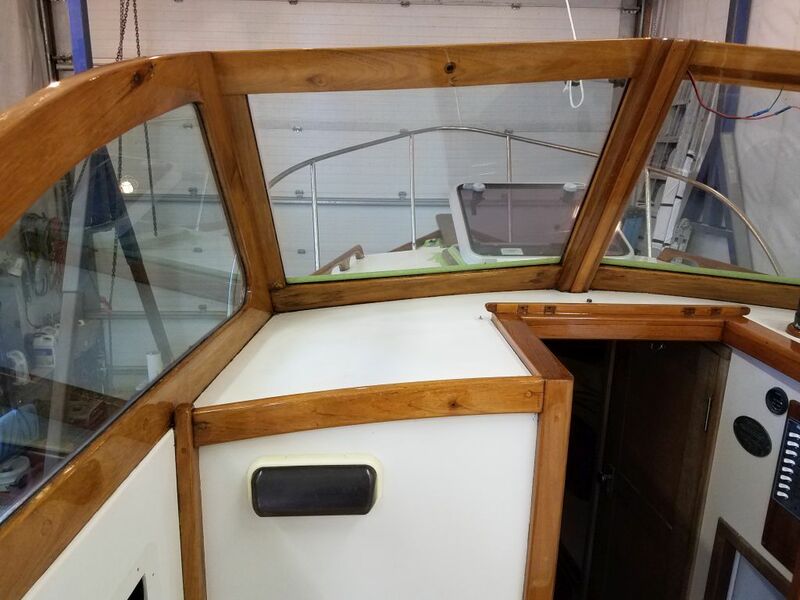 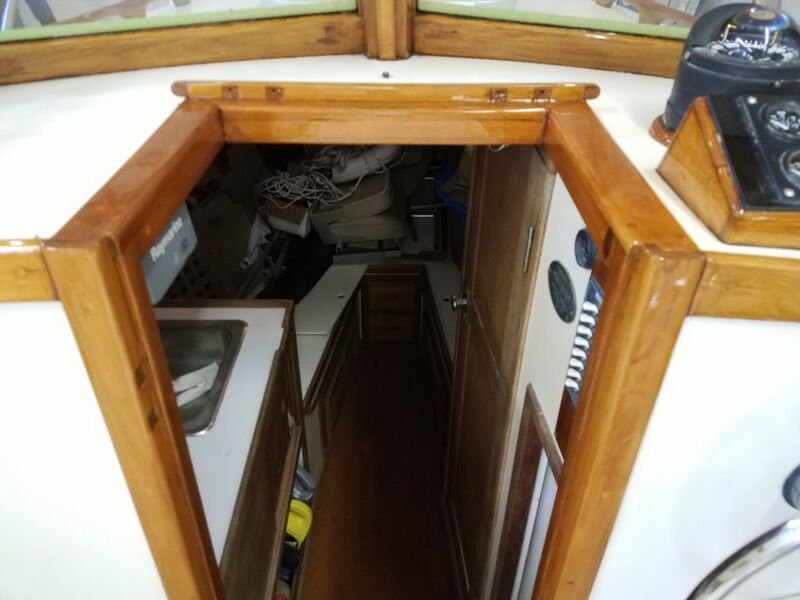 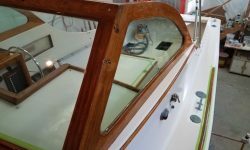 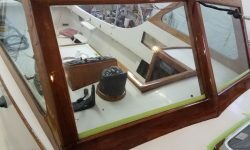 I’d planned to ream and fill all the fastener holes around the deck hatches, but it appeared these holes had previously been so treated, surprisingly enough. 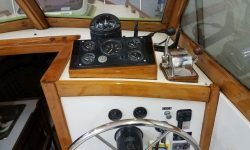 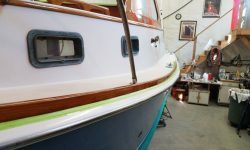 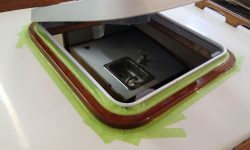 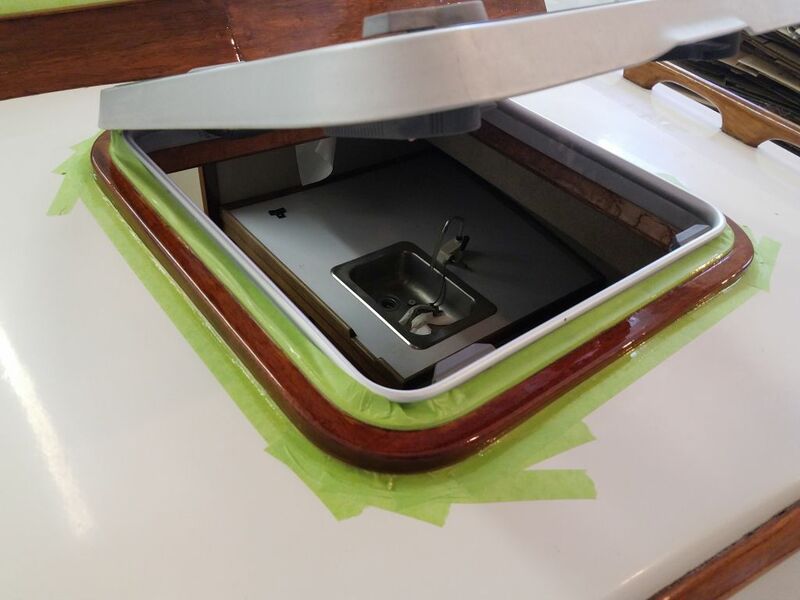 I also installed some little bronze trim pieces to cover the holes left from the engine box extension that I’d removed. 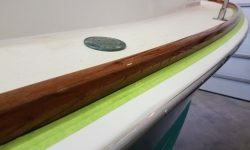 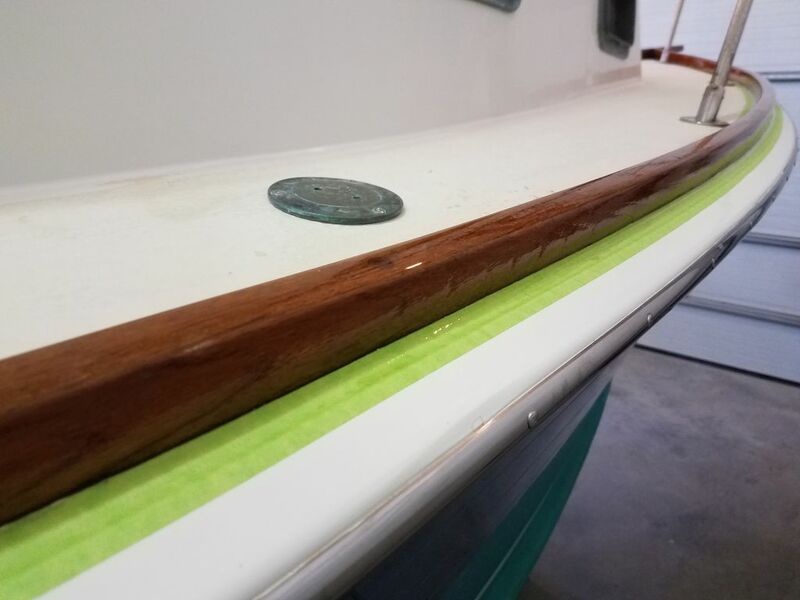 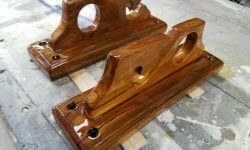 These would soon weather to match the other bronze on the boat. 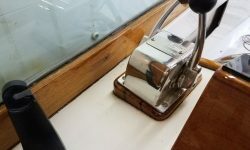 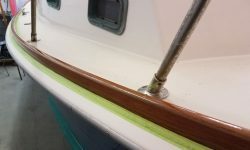 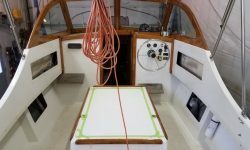 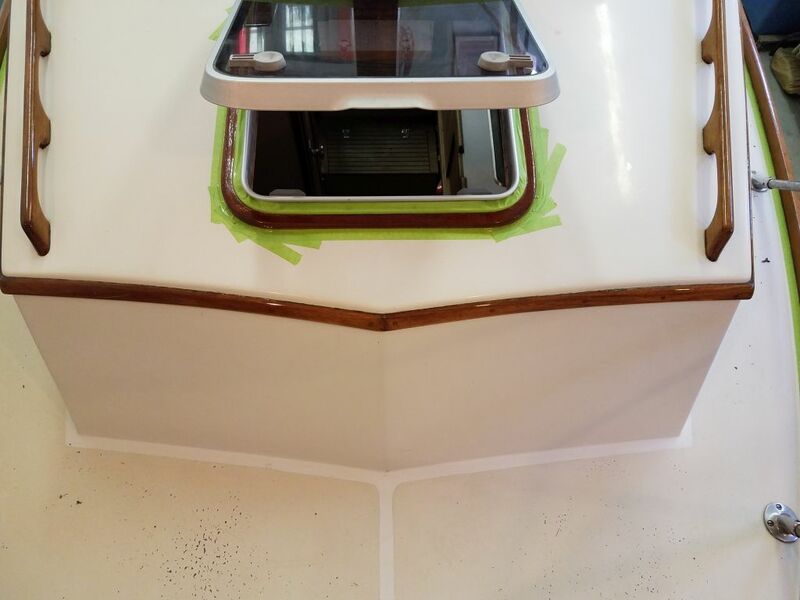 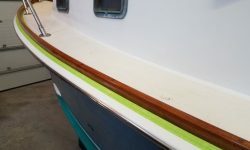 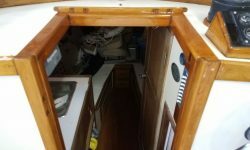 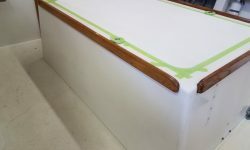 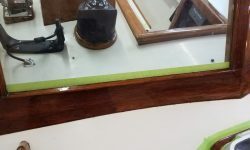 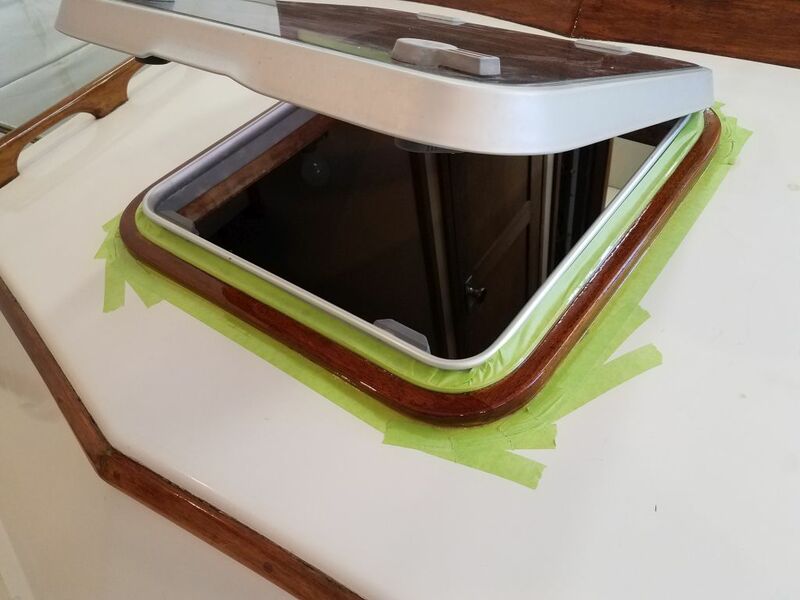 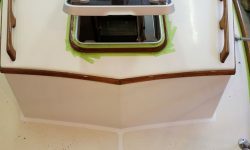 I used VSB tape to install the trim pieces. 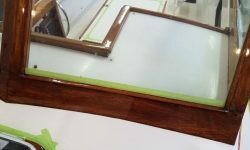 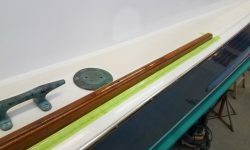 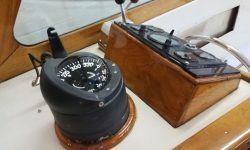 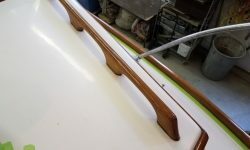 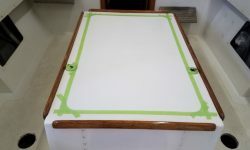 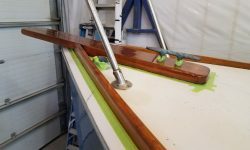 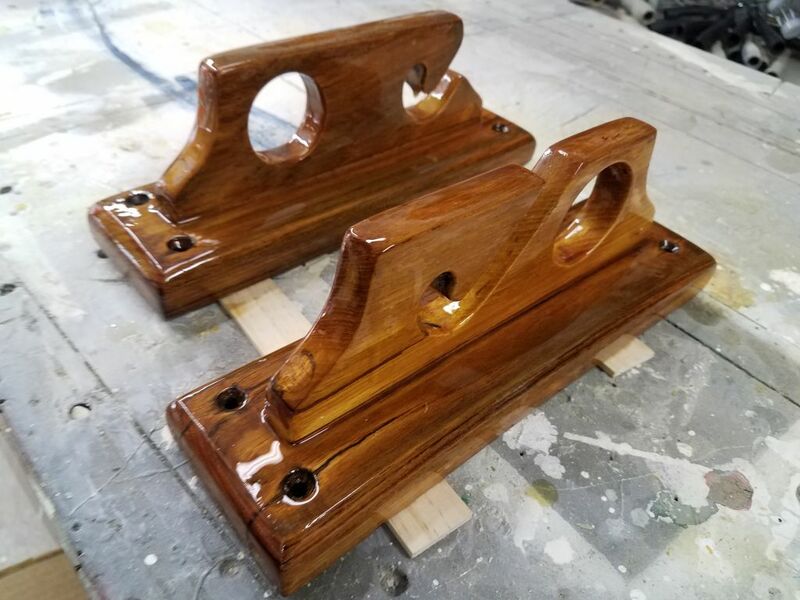 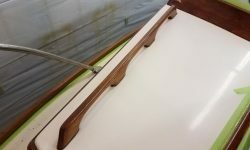 Continuing with the varnish work on the toerails and forward hatch, as well as the rod holders from the cockpit, I lightly sanded, cleaned, and applied a third (toerails) or fourth (hatch and rod holders) coat of varnish. 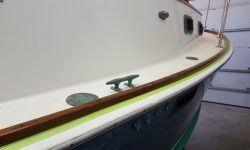 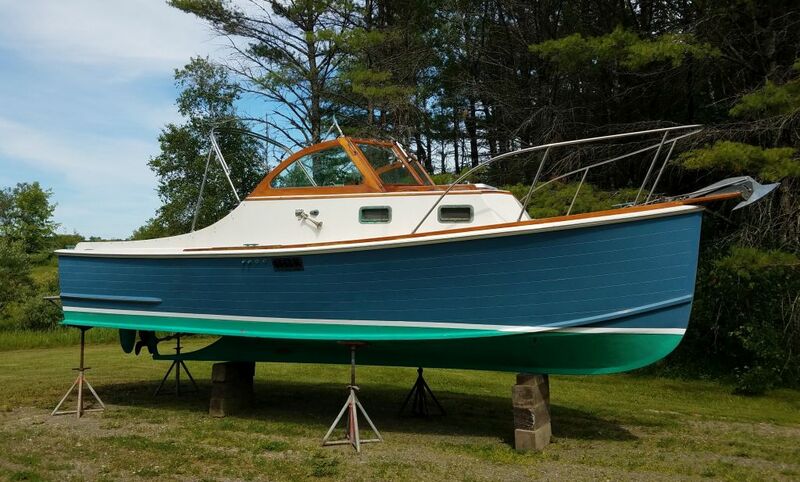 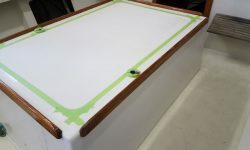 For this project, the owner and I selected KiwiGrip paint for the nonskid, partly because its aggressive texture was practical, and would also adapt to the existing surface without undue preparation efforts, but also because the product was easily tinted to any reasonable color, and the owner specifically wanted Moon Dust, a standard Awlgrip/Alexseal color. 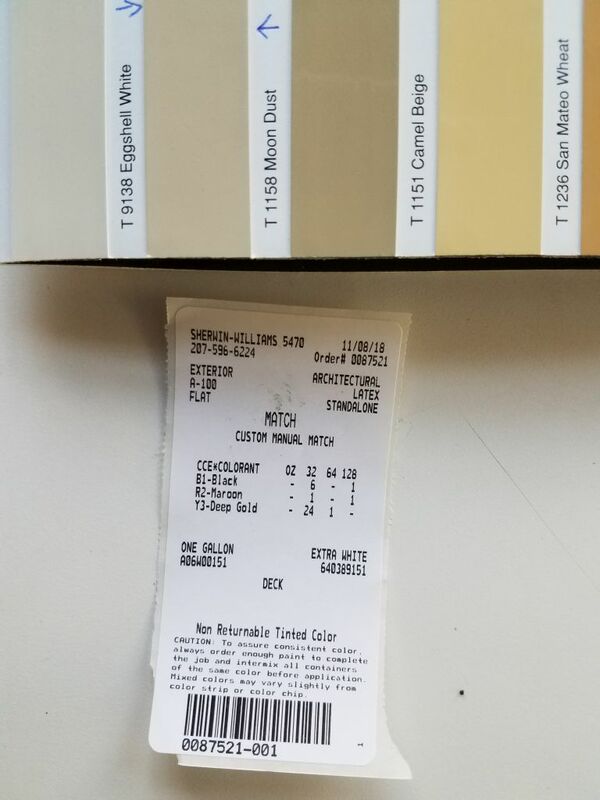 With the white base paint now on hand, I headed to a local paint store to match the color from the chip and get the paint tinted accordingly. 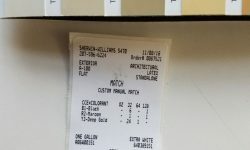 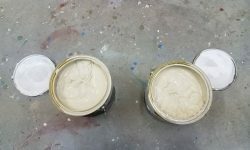 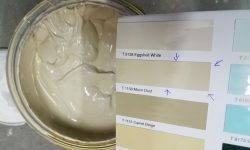 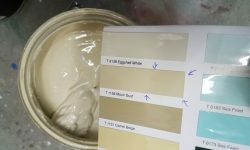 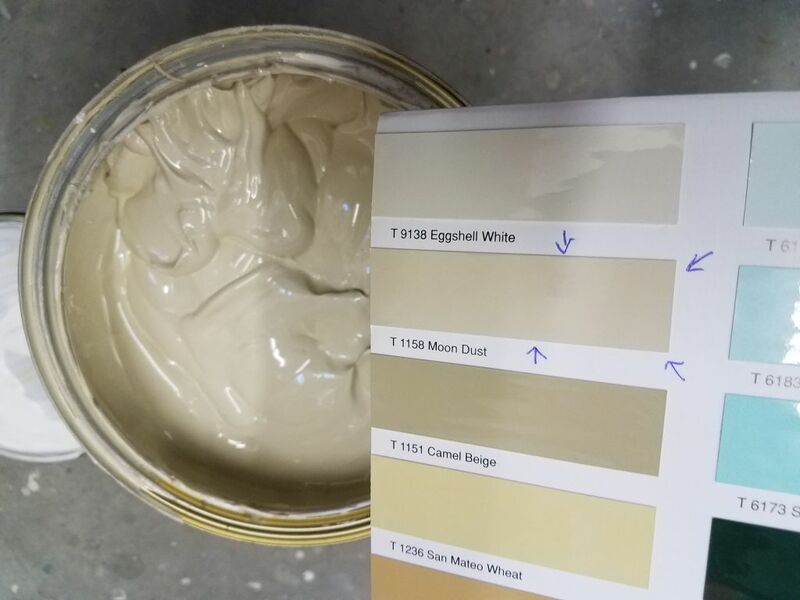 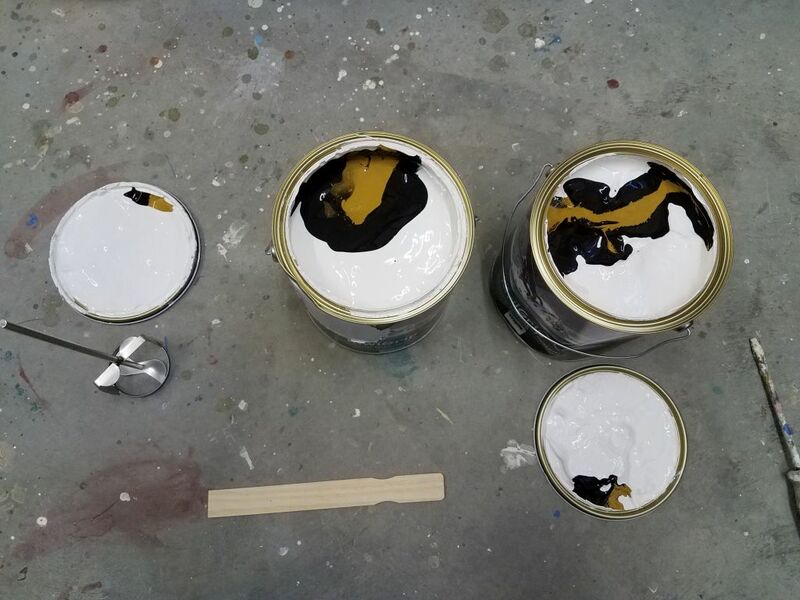 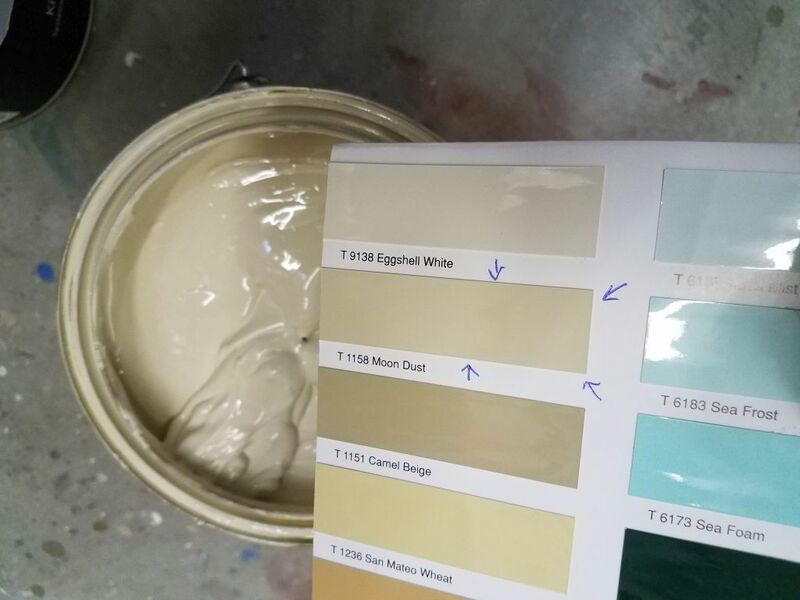 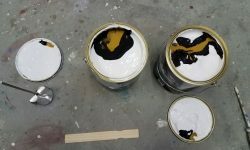 The only hiccup in this process, and I’d found this during previous experiences with the paint and tinting, was that the gallon-sized paint mixers at many paint stores don’t fit the 4-liter KiwiGrip cans, so when I got back to the shop I had to hand mix the pigments into the paint with a drill mixer. 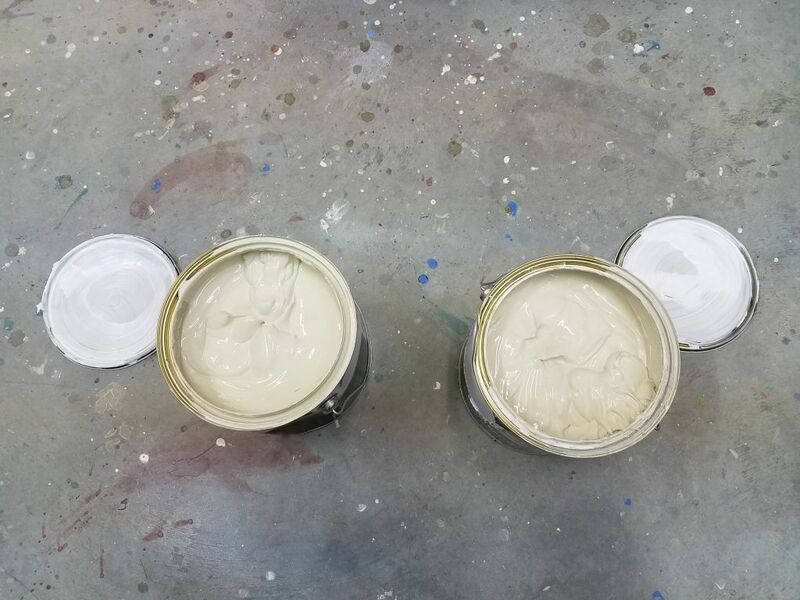 This took about 15 minutes for the two cans.